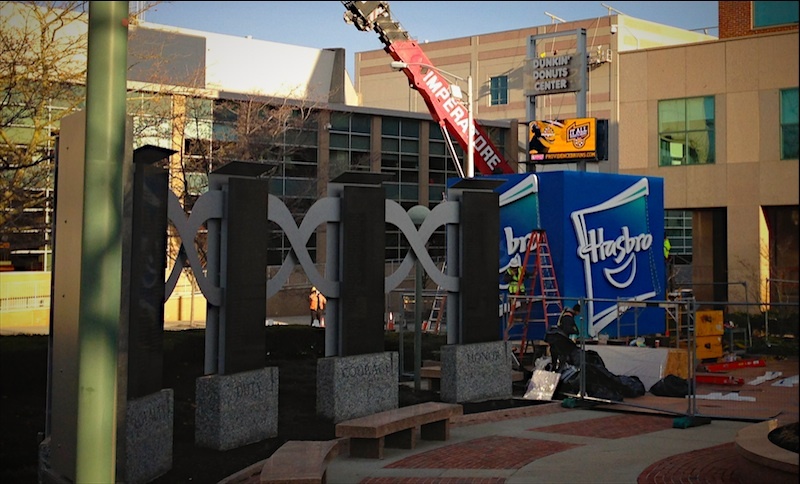 Workers this morning were working on installing a new sign at Hasbro’s LaSalle Square offices. Apparently the sign which is being installed on the top of the building will light up and spin which of course I think is wicked cool! The sign is up on the building now, but I did not stop to take a photo of it. WPRI just aired a segment that said Hasbro is 3-6 months away from a decision on the location of their HQ. I really can’t see them staying in Pawtucket. This got me thinking… does Proccaccanti still own the large lot in LaSalle Square? This would make the most sense for Hasbro, as it is across the street from their current building and they could create a downtown campus. 2,000 new employees downtown would be great for the city. This could provide the landowner with an anchor tenant to develop a mixed-use building. Retail on ground, offices directly above, and condos on the higher levels. It would also change the skyline and streetscape as you enter downtown from 95. I can’t really see Hasbro landing anywhere else. Having multiple billion dollar companies headquartered in the city will give it much more clout. I still can’t believe that Citizens Bank chose a 1980s style suburban compound. Hasbro, being a creative company, won’t make that mistake. While I have no inside info on this, I would agree that all logical indicators point to a move to Providence. Seems rational to move to the core of the nation’s 39th largest metro, a downtown that already has international and national corporate headquarters, already has a major facility downtown, has proximity to major convention and hotel facilities, great entertainment, sports, culinary excellence, historical sites, major educational assets, and transportation hubs. An interesting tip-off was the feature in the Projo months ago highlighting the “Industrial Bank” building as a new Hasbro HQ and Paolino’s supportive position.